Title: Garfield © Paws, Inc.
Garfield needs your Child's help! Pooky has gone missing at the zoo! Join Garfield, Odie and Nermal on a zany adventure at the zoo and help Garfield find his Teddy Bear Pooky in this personalized adventure where your child is the star! Kelsey Shaye Whiting, age 8 years old,was at the zoo near Midland, Texas when she saw Garfield and his friends. Noah and Josh knew how much Kelsey loved Garfield. “Are you sure you didn't eat him?” asked Nermal. “I'll help you find Pooky!” said Kelsey. Kelsey and Garfield followed the footprints. “Will we find Pooky here?” Arlene asked. “I hope we don't find a swamp creature instead,” said Nermal. “Arf!”Odie barked. He wanted to play ball. “Oh, all right,” Garfield said and threw the dingleball. Odie smiled and chased after it, running into the crocodile swamp. “Uh-oh! Watch out for that croc, Idie!” Kelsey shouted. A big mama elephant was giving her baby a bath. The elephant sprayed water from hertrunk, splashing Nermal. Luckily, Garfield and Kelsey ducked just in time and didn't get wet. “Yuck! This is worse than Odie's drool,” whined Nermal. “Hey,” said Garfield. “Where is Odie? “Let's keep following the footprints,” Kelsey suggested. Garfield and Kelsey walked by the monkeys, who were swinging in the trees and eating bananas. Nermal made a silly face. “I look like a monkey,” he said. A monkey squeezed a banana in each hand. Pop! Pop! 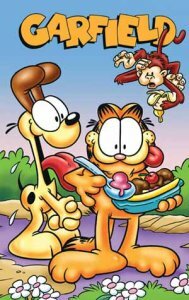 The tasty fruit shot into Garfield's open mouth. Suddenly, Odie appeared, carrying the dingleball in his mouth. “We thought the crocodiles got you,” Arlene smirked. “Let's look for Pooky in the bird sanctuary, “ Kelsey said. Kelsey walked with Garfield and his friends across a rope bridge. Brightly colored birds flew through the air. One with a wiggly worm in its beak landed on Garfield's head. “I think the bird wants to share her food,” said Kelsey. “I filled up my tank and I'm ready to roll,” said Garfield patting his tummy. “Maybe Pooky is here by the lions,” said Kelsey. “Rwarrr,” Nermal let out a little roar. “RWARRR!”A lion let out a big roar. Kelsey wished Noah and Josh were there to hear how loud the lion's roar was. “BURRRRP!” Garfield let out an even bigger belch. “Garfield, it looks like you're king of the jungle today,” said Kelsey. Garfield and his friends watched the bears swim and splash in the pool. Garfield's veterinarian, Liz, was there too. “Polar bears live in the Arctic and eat fish, Liz said. “I know where polar bears keep their money,” Nermal said. “In snow banks.”Nermal said with a smile. “The what?” Garfield said worriedly. Just then a snake slithered down a branch and hissed, while a big hairy spider dropped from the tree. BONK! A big green ball bounced off Garfield's head. “Where did that come from?” the fat cat asked. A group of seals clapped their fins and barked happily. “They want to play,” Kelsey said. “Let the games begin,” Garfield declared. Kelsey tossed the ball to Odie. The dog smacked the ball with his big red tongue and sent it flying back to the seals. Garfield, Kelsey and Odie met up with Nermal and Arlene at the big fountain. Garfield and Odie's owner, Jon, handed the teddy bear to Garfield. “Where did you find Pooky?” Kelsey asked. “That would be great! I can't wait to tell Noah and Josh about our adventure.” replied Kelsey.